Odell Beckham Jr. has been listed as questionable for the New York Giants' season opener against the Cowboys in Dallas on Sunday night. Questionable in NFL terminology is a 50-50 chance to play. Beckham has not practiced since spraining his left ankle on Aug. 21 in a preseason game against Cleveland. He stretched with teammates before practice on Wednesday and Thursday, but worked with trainers during the practices. 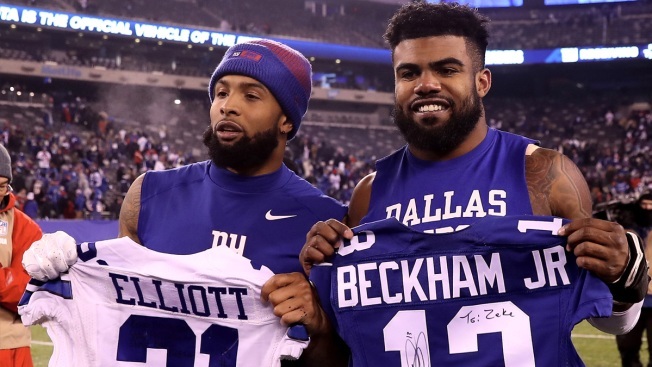 The three-time Pro Bowler and the Giants' leading receiver will have another chance to practice Saturday when the team works out at roughly 85 percent of full speed before traveling to Texas. Coach Ben McAdoo said Beckham would work with trainers Friday, a day the Giants let players rest and recover.